253,756 pounds of E-waste to be recycled and used to support Indianapolis based social venture organization focused on reentry programs and job training. Bloomington, Ind. 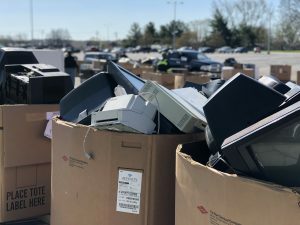 – On Saturday, April 28, Cook Group partnered with RecycleForce to host a community electronic disposal day that gave Bloomington area residents and small businesses an opportunity to recycle their unused electronic appliances, devices and televisions. RecycleForce is an organization that helps formerly incarcerated individuals rebuild their lives through workforce training, development, and job placement in their recycling facility. Cook and RecycleForce partnered for the event because the organizations believe in breaking down the barriers to employment that hold people back and creating a cleaner environment. The event, sponsored by Cook, saw hundreds of residents’ turnout and drop off over 250,000 pounds of E-Waste. RecycleForce will disassemble the electronics at their facility in Indianapolis and use the proceeds of the recycled products to fund the organization’s comprehensive reentry programs helping the formerly incarcerated individuals reenter the workforce. RecycleForce is a 501(c)3 social enterprise based in Indianapolis, Indiana that delivers comprehensive and innovative recycling services in support of workforce training, development and job placement for formerly incarcerated men and women transitioning back to society. Visit our website to learn more about our reentry programs and recycling services: www.recycleforce.org.